The LEGENDARY PRIMEVALS are out with a new release! 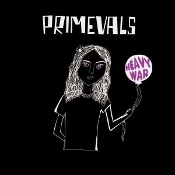 'Heavy War' is a 11 tracks full-lenght vinyl record, 11 pure gems! The Primevals are a Glasgow rock group formed in 1983, who were influenced by the MC5, The Stooges, Captain Beefheart, Pharoah Sanders, The Gun Club, The Cramps and 1960 s US garage rock. This is high energy garage punk swamp rock! And very well done!!! !